This oil painting guide book on producing figure art contains ten art demonstrations centering upon classic oil paintings from old masters. Each demo contains in depth instructions on how each painting was completed. An invaluable guide for artists wishing to explore flesh tones in art, this book also gives invaluable tips on conducting the underdrawing, the under-glaze and making oil painting simple and manageable within any environment. 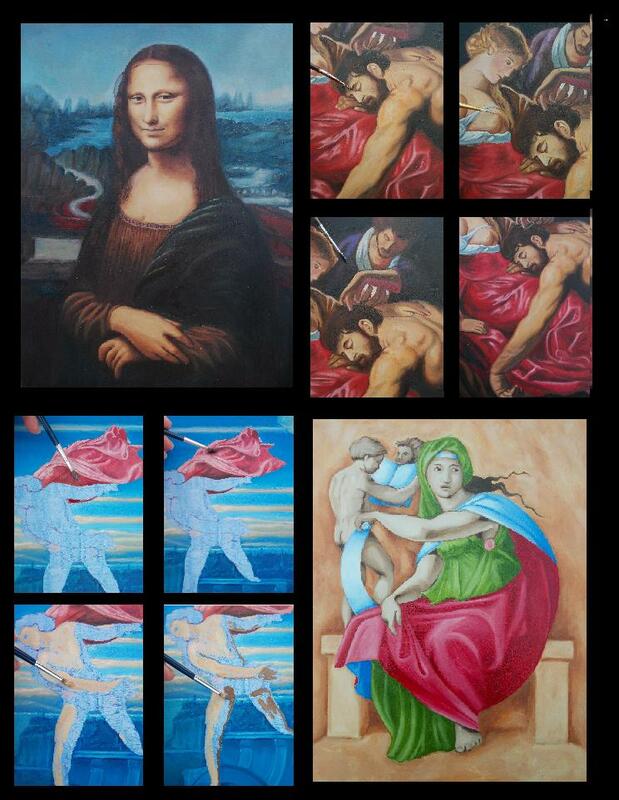 Now available in large edition, the old master paintings were selected with an art technique in mind. Each chapter is dedicated to one painting. 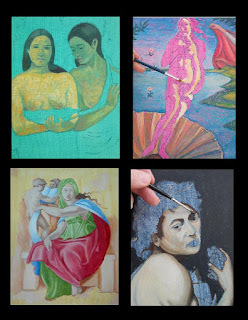 Sections include background information on the painting depicted; explanation of the oil painting technique to be explored, a list of art materials needed and then (on average) 28 images in progress with accompanying instructions. 1 The Valpincon Bather (1808) by Ingres. Technique explored: grisaille effects. 2 The Mona Lisa (1503) by Da Vinci. Technique explored: sfumato. 3 The Birth of Venus (1483) by Botticelli. Technique explored: sgrafitto. 4 The Sleepers (1866) by Courbet. Technique explored: dry-brushing. 5 Samson and Delilah (1609) by Rubens. Technique explored: blending systems. 6 Breasts and Red Flowers (1899) by Gauguin. Technique explored: scumbling. 7 The Sistine Chapel Ceiling detail: The Delphic Sibyl (1511) by Michelangelo. Technique explored: cangiante. 8 Sick Bacchus (1593) by Caravaggio. Technique explored: chiaroscuro. 9 Bacchus and Ariadne (1520) by Titian. Technique explored: fine glazes. 10 The Great Bathers (1894) Cezanne. Technique explored: impasto. This book contains extra features, including: an overview on painting flesh tones; a preparatory guide to oil painting, guide to art materials, troubleshooting problems and a glossary. The paintings were produced via modern art materials and modified techniques, not used in the times of the artists depicted. 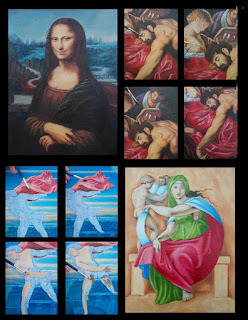 The aim is not to create a carbon-copy of the painting depicted; background elements have been altered and colors of some garments changed. The aim is make these figure paintings inclusive, promoting art exploration. Print book’s dimensions: (large edition) 10x8in and 118 pages bursting with colour images. See screenshot for how the interior looks. (Pocket sized edition): 8.5x5.5in and 192 pages. Also available on Kindle. My other book, ‘Portrait Painting in Oil: 10 Step by Step Guides from Old Masters' similarly explores skin tones in portraiture. Artists featured within this book are: Delacroix, Gauguin, Velazquez, Botticelli, Wright of Derby, Jacques-Louis David, Rossetti and Vermeer.